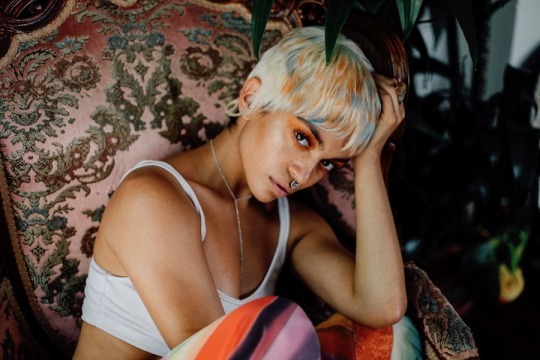 “Fantasy soul.” That’s how QUIÑ describes her own trademark sound, and upon hearing sophomore EP, DREAMGIRL, the self-description is picture-perfect. From start to finish, DREAMGIRL is an absolute dream, existing in a realm that radiates the essence of a pastel-tinged and ethereal voyage. “The Beginning,” the opening track on DREAMGIRL, sets the tone perfectly for the rest of QUIÑ’s neon-lit musical journey. “The Beginning” immediately establishes the depth of range behind the artistic vision that is “fantasy soul.” Yes, this is soul, and yes, this is dreamlike, but QUIÑ showcases she is so much more than just a spin on a pre-established genre. Drawing from not only the world of soul, but R&B and hip-hop, as well, paired with mesmerizing production, DREAMGIRL delivers on multiple accounts. For instance, the clear depth present on “The Beginning” – abound with flourishes of pixelated production that QUIÑ’s velvety voice springs across effortlessly. The entrancing moments of cross-genre pollination and transfixing production permeate the entirety of DREAMGIRL beyond just “The Beginning,” with “Happened to Happen” serving as another shining example. Featuring rising Compton rapper and fellow Ones To Watch favorite Buddy, “Happened to Happen” sees QUIÑ’s fantasy soul being leveraged in newfound ways – leading the track beautifully yet also showing the power her voice holds as textural background for Buddy’s spitfire verses. DREAMGIRL also sports a feature from Syd, of The Internet and Odd Future, in “Sticky Situation” that boasts dreamy visual and sonic aesthetics, which we’ve been in love with for some time now. Ultimately, DREAMGIRL, is a sonic testament to QUIÑ’s sense of musical adventurousness. Craving out one’s own genre can be fraught with trials and hardships, but QUIÑ also embodies the possibility behind marking out one’s own musical path – creating something never heard before, akin to fantasy itself. Discover QUIÑ fantasy soul for yourself in DREAMGIRL below and keep up to date with QUIÑ on Ones To Watch.